Dream Day Out & Winners! Oh Dear! In all the rushing, bustle, packing, comings and goings of the last few days, I almost forgot to show you a surprise parcel that arrived from the USA this week from my blogging buddy Carin from Conceived Without Regard For Reason Or Reality, (Phew! That's a mouthful!!) Carin and I 'met' by visiting each other's blogs and we've blogged, emailed and I've sent her a couple of little surprise gifts and we've discovered a similar warped sense of humour - look out world! Tee! Hee! Hee! A box of goodies!! I've mentioned a few times during my winter posts that hot chocolate is one of my fave ways to warm up and Carin sent me a tin our HER fave hot choc mix - peppermint candy cane hot choc - YUMMO! Hmmm suddenly I want it to be cool again so I have an excuse to have hot chocolate - oh wait, who NEEDS an excuse! Tee! Hee! 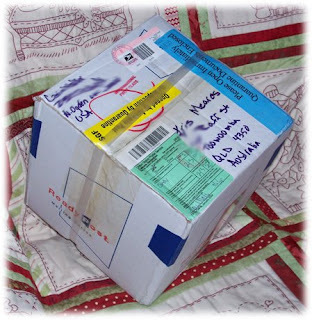 She also sent some of her fave herbal bed time tea, but obviously the officers at the Australian Customs office have been having trouble sleeping, because they kept the tea! 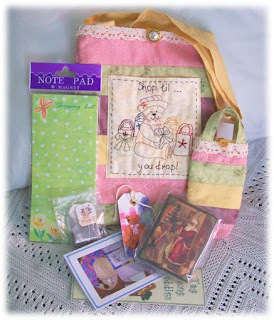 There were also two fun craft patterns - one will match wonderfully with the two stitchery panels Inger Lise sent me in her recent Bag Swap package and the other is a cute teddy bear!! COOL! And "uh oh!" as I add two more projects to my "To Do" list!! Tee! Hee! Hee! But wait ... there's more! Carin also included some American candy. She said, "I wanted you to know I think you are a 'Sweettart', not an 'Airhead' at all and one 'Hot Tamale'!!" Thanks Carin! And the candy was yummy too! Tee! Hee! Hee! In fact I think I could become addicted to the Hot Tamales - I loooooooove cinnamon flavoured candy and there just isn't a lot of it available in Australia. Anyways, I've got a busy morning ahead of me tomorrow, packing three quarters of our household to take on holidays with us - why is it that you need to pack almost as much stuff for two weeks holiday as you would for two months?!?! Hope you all have a fantastic week - next time I check in, it will be from sunny Bargara! Til then - Bear Hugs! Where to begin ... well, my best bud since year 4, Lynette, arrived Friday night, primed for a sleep over and a day of stitching at the Stitchers Dream Day Out at Highfields. As is normal when we get together, Friday evening was spent chatting and catching up (poor GB's ears were probably bleeding by the end of it! Tee! Hee! Hee!) and a few slightly alcoholic beverages were consumed, all adding up to a very pleasant evening. First thing Saturday morning, we gathered our stitching supplies, coffee mugs and camera and off we went to join day one of the 2008 Stitchers Dream Day Out, hosted by Marian and the girls at Quilter's Angel. We arrived to find morning tea in full swing (Damn! Shouldn't have filled up on croissants for breakfast!!) 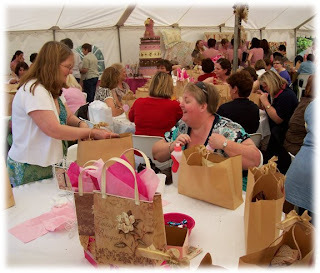 so we signed in, grabbed a cuppa and soon joined about 140 other ladies to troop into the most fabulously decorated marquee you have ever seen. I didn't get a photo of the main samples display area because there were always lots of people near it, but did take this pic of the prize table. Looks good enough to eat, doesn't it? 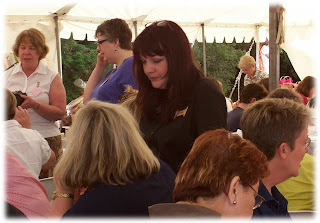 So then we shuffled our way further into the tent to find our assigned table - number 15. Hmmm ... it occurred to us that table 15 was waaaaaay in the back corner. Now, usually the naughty people get sat in the corner - were they trying to say something about Lynette and I??? Actually, it's a change from school, where we would no sooner walk into a classroom than the teacher would assign us to OPPOSITE corners of the room to stop us chatting during class! Not much has changed, really! Tee! Hee! Hee! And what did we all find waiting on the tables for us? GOODY BAGS!! YAY! Here's everybody peeking into their bags amidst lots of happy 'Oooooh'-ing and 'Aaaaaah'-ing! So many fun pretties, and too many to list on a post that's supposed to be shorter on words!! Don't we look industrious? Looks can be deceiving! Tee! Hee! Hee! 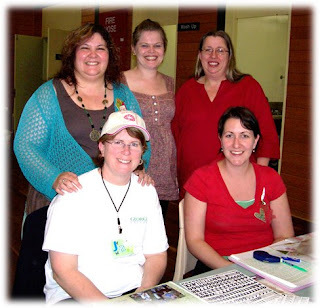 We had a lovely time chatting to the other ladies at the table, all of whom had travelled from near and far to be at the Stitchers Dream Day Out - I was the only Toowoomba local!! Here's Lesley explaining something to some of the ladies. And Leanne also enjoyed chatting with ladies. And when she stopped at our table, she was very impressed with Lynette's stitching, and told Lynette she was doing a fantastic, neat job. Now since this was Lynette's first stitchery project, she was pretty chuffed! The afternoon ended with Marian reading out a poem that asked the question, if you knew it was the last time you would see your loved ones, what would you do differently? Would you hug instead of scold, kiss instead of complain, take a risk instead of playing it safe, say 'I love you' rather than 'see you later'. It reminded us all that life can be short, uncertain and unpredictable, so we should wring every little bit of enjoyment, fun and experience from it and take more time to be with our loved ones, to tell them how we appreciate and love them and perhaps put off some of the chores that really can wait til tomorrow to have a cuppa with a friend or stitch something for a 'just because' gift. So ... we all went away after a fantastic day of stitching, chatting, making new friends and enjoying established friendships - oh and did I also mention most of us indulged in some retail therapy to varying degrees? Tee! Hee! Hee! 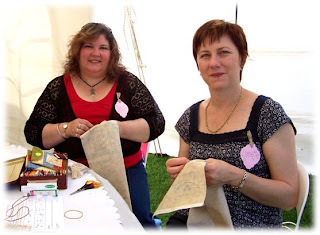 Lynette and I are hoping to make a return trip to Stitchers Dream Day Out next year, but since neither of us were sure what we're doing next WEEK, we thought it might be a bit soon to start planning next YEAR! A HUGE thank you to Marian, Libby, Leanne, Lesley and Debbie, as well as the girls from Quilters Angel who worked so hard behind the scenes to make this a special and enjoyable day for us! And thanks too, to the businesses who were kind enough to donate vouchers and goodies for the goody bags - I think a lot of us will be having future retail therapy thanks to them!! Tee! Hee! Hee! So ... that was my busy Saturday. Today has been spent making preparations for holidays - washing, packing, writing lists, losing lists, panicking that I've forgotten something!!! Tee! Hee! Hee! But never fear, even though I shall be enjoying Bargara's warm tropical temperatures, sandy beaches and holiday pace, my beloved Geek Boy could no more leave his laptop at home than chop off a limb, so I will be contactable by email and will be checking up on my fave blogging buddies, as well as posting photos to skite about our holiday! Now ... I know I promised to try to keep this short so you don't doze off, but I do need to announce the winners of the Angel Bear Pattern give away. 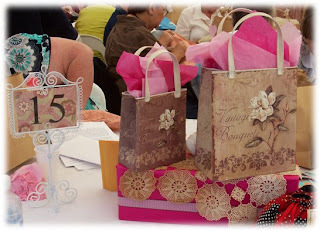 And the winners are ... PEG from Happy In Quilting and Ann-Maree who either doesn't have a blog or has it through another provider and blogger won't tell me!! 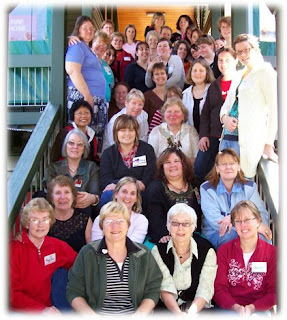 So, ladies - CONGRATULATIONS!! I hope you will enjoy stitching these cute little angel bears. I hope you will "bear" with me a little, as I didn't plan very well and won't be able to post these to you before I head off on holidays tomorrow, but promise to send them as soon as I get home!! So if you'd like to email me with your snail mail addresses, I'll have them all ready for my return in two weeks time. And on that note, I shall sign off and go find my togs, sarong, sunscreen and thongs (flip flops for all you overseas people who don't speak Australian!!). Mind you, I've packed so many sewing projects that I may not even venture out of our cabin for the two weeks!! Tee! Hee! Hee! Hope you've had a great weekend, too, whatever you've been up to, and stay tuned for the Holiday Adventures of the Mad Meares'! Tee! Hee! Hee! Til next time - Bear Hugs! Here am, doing a happy dance! SKIPPITY! HOPPITY! SHUFFLE! SHUFFLE! BOOTY SHAKE!! Why, you may ask, am I alarming the neighbours by doing my Happy Dance? 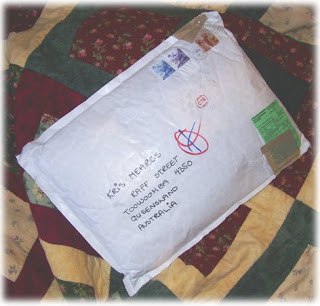 My bag swap parcel arrived to day - all the way from Norway!!! YAY!! I didn't actually see the postie deliver my parcel (for which the postie is probably VERY thankful! Tee! Hee! Hee!) but my beloved GB brought this in from the front verandah. WOW! How spoilt am I?!! Let's see, there's a wonderful hand-made card, two stitchery designs all traced and ready to stitch (now that is really spoilt - no tracing!! YAY!) some Norwegian chocolates and ... another layer of wrapping! This is better than playing "Pass the Parcel" at a birthday party!! 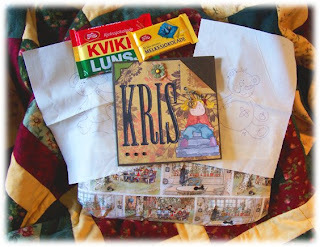 I paused at this point to read the card and discovered my parcel of goodies had come from Inger Lise in Norway - THANK YOU INGER LISE!! She said she'd popped in to visit my blog a few times to see what colours/designs etc I was into and she wrote the card in front of the computer, with my photo on the screen so it was like talking to me - how cool! 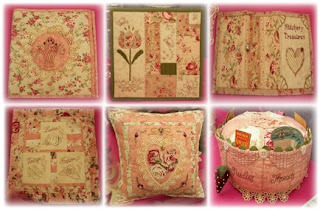 What a great colour and the wonderful patchwork is sooooo neatly machine stitched that it almost looks bought! I was pretty chuffed with my ruby red bag ... but then I discovered that the zippers were NOT just for display, they actually unzip! And what did I find behind the zippers?? A girly bear!! Awwww! Isn't she sweet!! And if you look closely, you'll see that Inger Lise has stitched "Your Secret Swap Partner, Lise" along the side of this panel so I will always remember the VERY clever crafter who sent it to me - as if I could forget!!! And the extra-special bit about these clever hidden panels? They make the bag bigger when they're opened out so I can fit more goodies in there! Hmmm, I think this would be the perfect bag to take to the patchwork shop next time ... "Oh, wait, I can buy even more yummy fabrics because this gorgeous bag that Inger Lise made me EXPANDS!!!" Tee! Hee! Hee! Thank you soooooooo much Inger Lise! I just LOVE this bag! It must have taken you hours and hours of stitching to create it, not to mention being clever enough to work out how it all goes together! I'm feeling VERY SPOILT!! 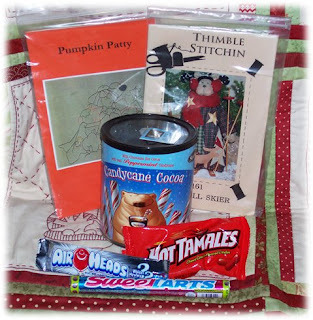 And a big thank you to Linda, too, for organising this fun swap. This was the very first swap I've ever signed up for and I told myself that if it didn't work out too well, I wouldn't sign up for any in the future. Well, I'm guessing my future will include LOTS of swaps to duplicate the fun this one has been!! I think I just heard GB faint in the next room! Tee! Hee! Hee! Oh! And I don't know whether regular readers will remember me saying right at the start of the swap that I had received an email from my sneaky swap partner and that after some amateur sleuthing (and a lot of blog reading!!) I thought I had worked out who my partner was - well, it turns out I was right! I had narrowed it down to either Stina or Inger Lise and finally decided it was Inger Lise. Maybe I should become a detective ... NAH!!! Then there'd be no time for stitching!! Tee! Hee! Hee! And posties world-wide must've been on the ball today delivering parcels for Linda's Bag/Bucket Swap, because I got an email from the wonderful Jeanette in Finland to say that the bag I sent her had also arrived and she loved it! PHEW! It was a bit nerve-wracking making something for a fellow-stitcher when I wasn't entirely sure of her tastes, so I'm very pleased Jeanette liked my little 'Shop Til You Drop' bag. 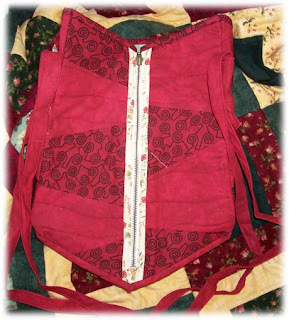 My original version of this, made as the sample for the pattern, is my most used bag - it's just such a handy size!! I hope Jeanette finds it handy too. Now, I was going to share my renovation story with you, but I've run out of time and room for today, so will try to get back tomorrow. Don't forget - you still have a few days to leave a comment on the post two back to be in the running to win one of two copies of my new pattern. All you have to do is tell me about your little angel. But for now, I'm off to tackle the weekly grocery shopping with my 'big' angel GB, so I shall sign off. Til next time - Bear Hugs! Hmmm, having a sudden flashback to school days when we had to write a report after any class excursion - mind you, those excursions weren't NEARLY as much fun as the weekend's Creative Craft Retreat!! It could have something to do with the fact that as adults, there are fewer rules and more scope for mischief! Tee! Hee! Hee! There's me, Amber and Liz up the back and Jen (our pet American - just kidding Jen!! Tee! Hee! Hee!) and Linda in the front. Now, I could REALLY tell you some stories ... but we agreed right at the beginning of the retreat that "What happens at the retreat, stays at the retreat!" Tee! Hee! Hee! If I told tales, the other four would hunt me down, so suffice to say we had a LOT of fun and perhaps it was fitting that we were sitting in the corner!! 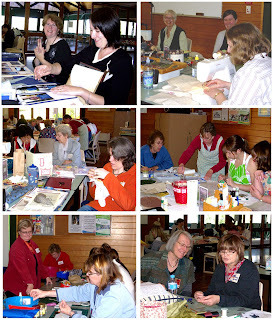 Let's see, the first picture is Jen and Linda in action; the other "Do Your Own Thing" table; a mixed table of DYOT and Val Laird (in the middle) teaching a small embroidery class; Leanne, (second from left) who did my bear making class at last year's retreat, taught basic folk art; card making; and well known quilt designer/tutor/inspirational speaker Robyn Ginn teaching her unique (and much easier!) 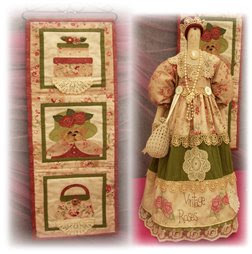 version of needle-turn applique. Whew! So, you can see the hall was just BRIMMING with creativity! Oh! There was also a beading class that weren't sitting at their table when I was taking photos - oops! I meant to go back and forgot - sorry girls! Now not only did we enjoy a weekend of crafting, we were fed soooooooo well and often that we all waddled out the front door to go home on Sunday!! There was also some free time to enjoy the wonderful bush surroundings of the Lake Perseverance Recreation Centre. 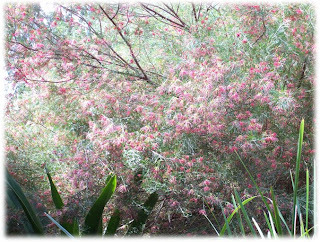 Wildflowers and native plants were all starting to show off their finery, so I snapped a couple of pics. 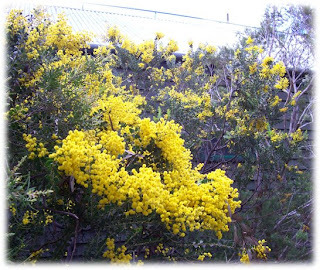 Isn't this wattle a cheerful, bright yellow? And the flowers look like hundreds of little yellow powder puffs! Grevillias are also flowering their little heads off at the moment! This one looked like a cloud of soft red/burgundy from a distance and caught my eye every time I walked past it on the way to the little girl's room. 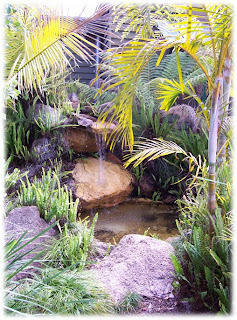 And this water feature was in a small courtyard area off the main hall, providing a quiet spot for meditation - or a nanny nap to make up for the late night/early morning bed time! Tee! Hee! Hee! Now all of this sounds wonderful enough, BUT WAIT, THERE's MORE!! We were also treated to a guest speaker, Debbie Dodds. Debbie is a Chaplain at one of Toowoomba's state high schools and encourages people to see the humorous side of life, even in serious situations. Again, we all had sore cheek muscles by the time Debbie had finished! And before we all toddled off home, exhausted but happy on Sunday afternoon, there was time for a group snap. Aren't we a good looking bunch? So ... you're probably wondering where the photos of everyone's finished projects are. Well,it was like this - there was supposed to be a show and tell session at the end of the day before pack up, but people started to pack up and drift off early, which prompted some table and chair packing to get a head start on the end-of-camp tidy up ... and before we knew it, all craft had been packed away and no photos were taken - DOH! However, one of the projects I worked on was the latest block of Lynette Anderson's Noah's Ark BOM and I attached borders this afternoon, so I can show you that. 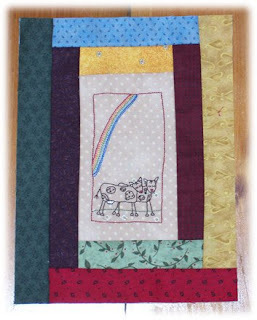 I love the rainbow in this and the cow block - ah, lets face it, I'm rather partial to ANY rainbow!! Tee! Hee! Hee! So ... that's my Craft Retreat Report. I'll be back in the next day or so with a Renovation Report - my beloved Geek Boy is on holidays for three weeks and although we're off to the beach next Monday for two weeks, this week is 'work around the house' week. It started with him attacking the sanding outside ready to paint, but, as usual with older houses, the job has changed a little, so stay tuned for the report!! 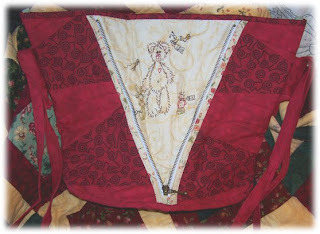 And before I sign off, don't forget the give-away to celebrate the completion of my latest pattern, "Angel Bears", a name/birthday sitchery wall hanging. I forgot to put the closing date on the previous post, but you'll have until Sunday night Aussie time to leave a comment so I can announce the winners before I head for the beach. All you have to do is leave a comment on the previous post telling me about your little 'angel' you'd like to make the wall hanging for to go into the draw. And if you mention the give-away on your blog and include a link back to my site, you get an extra entry, just let me know. Right now, I'm off to contemplate the contents of my pantry and fridge to come up with a culinary masterpiece for dinner ... hmmm ... wonder how GB feels about baked beans on toast! Tee! Hee! Hee! Til next time - Bear Hugs! Melodramatic Sigh!! "Geek Boy is MY hero!!!" He worked his computer magic on Photoshop and I was able to finish editing the pattern pieces for my Angel Bears Pattern, so it's now ALL PRINTED! YAY! Tossing of streamers! Blowing of whistles! A 21 gun salute! ... OK, so perhaps that's going a LITTLE over the top for the completion of a new pattern, but after the frustration of the computer-delayed printing, I was pretty excited! 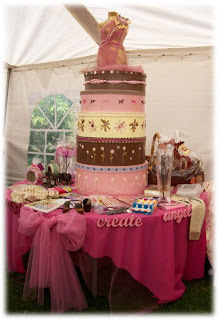 I actually clicked on the wrong photos to insert - was going to have a closer-up (there I go inventing terms again!) 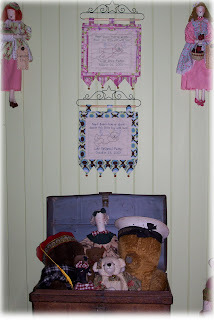 shot of the wall hangings that I'd put the pretty fuzzy edges on and shrunk so it didn't take forever to upload - but I clicked on the wrong one and then blogger just got carried away, so I let it go!! Tee! Hee! Hee! So you get a peek at my chest of bears in the lounge room, too!! Now, where was I before making an 'oops' click!?!? Ah yes! So ... you know what a completed new pattern means ... A GIVE AWAY! Now since this pattern is a name/birthday hanger that features a boy or girl angel bear (depending which you choose to stitch!) I think that to be eligible for the give away draw, you have to leave a comment on this post (not the last one, not the next one, THIS post!!) telling me about your little 'angel' that you'd like to make the wall hanging for. Everyone will go into a draw and two lucky commenters will receive a hot-off-the-press copy of 'Angel Bears'. And if you have a blog and mention the give away and include a link back to this post, I'll pop a second entry for you into the draw - just let me know!! So get commenting!! Now I know you're all wondering how my weekend at the Creative Craft Retreat was, but you'll just have to wait! I took some photos and need to go through them to edit for incriminating chocolate wrapers and chip packets!! Tee! Hee! Hee! So I'll post about that in the next day or so. Right now, though, I think I'm going to curl up with a nice cup of tea and give my stitching fingers and my laugh muscles a rest!! Til next time - Bear Hugs! Don't you just HATE it when you start to do something 'simple' and it either takes forever or you can't do it at all?!?! That's the kind of week I've been having! AAAAAARRRRRRGGGHHHHH!!! SIGH! I had very good intentions of working my way through a fairly long (probably unrealistic!) list of "Things To Do" this week, top of the list being FINALLY getting my Angel Bears pattern printed. So ... with the title and first sentence of this post ... you've probably guessed - CORRECTLY! - that not only has the list had hardly a dent in it, the pattern STILL isn't printed! Good guess! You see, I scanned the outlines for the patterns into the trusty (evil-instrument-of-torture!) computer in Photoshop, a program I use heaps to edit photos etc. Well ... I'm not sure WHEN or HOW, but SOMEHOW, a vital setting has been changed (probably during one of those incredibly annoying compulsory Windows upgrades!!) and now the program won't let me do what I want to!! Aaarrrrggghhhh!! I'm sure there's a way around it, but my beloved Geek Boy is at work, so isn't on hand to fix it for me, so the pattern STILL hasn't made it to printing standard yet! SIGH! So, for all of you waiting so patiently for my give-away ... please bear with me while I throw the computer out the window ... I mean ... while I wait patiently for GB to come home to fix the stupid thing! Someone once said to me that a computer is a quick way to do something - as long as you're not in a hurry!! And that's JUST how I'm feeling today! SIGH! Waiting, patiently ....!!! Adding to my frustration level has been the fact that I'm off tomorrow night for a weekend of stitching at the Creative Craft Retreat at Perseverance Dam (about 30 minutes north of Toowoomba) and as I'll be selling my patterns there, I REALLY wanted to offer this new one that I'm rather excited about. SIGH! I was actually supposed to be teaching at the retreat, but since the minimum sign up number wasn't reached ... I get to go along and do my own thing! So, while I'm a bit disappointed not to be teaching (it's fun helping people produce something they may not have been brave enough to tackle on their own!) I have a LONG and ever-growing list of projects that need attention, so I will certainly use the time wisely. Just think, a whole weekend of stitching and chatting while someone else does all the cooking and cleaning up - BLISS!! Will take some photos and share with you next week. 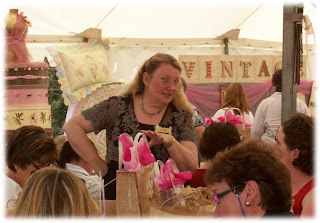 Of course, I'm also starting to count down to the Stitcher's Dream Day Out at Highfields on Saturday September 20. 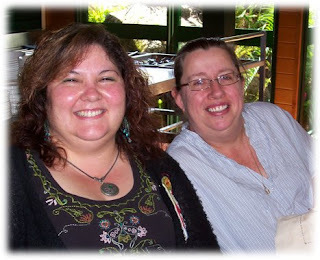 I had a quick chat with my best bud Lynette and since her schedule has also been a little crazy, she's really looking forward to our day of stitching and chatting, too. Just over a week to go - but who's counting!! Tee! Hee! Hee! And in the meantime, to take my mind of committing computercide (OK, so now I'm inventing my own language too - deal with it!! Tee! Hee! Hee!) 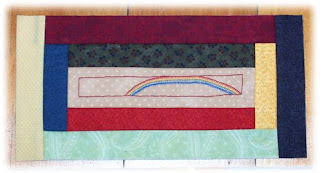 I've been stitching the latest block in Lynette Anderson's Noah's Ark BOM. I've got the indigo and violet bows to go on my rainbow, so hopefully I'll get that finished tomorrow. I love the effect that comes from the echoed lines of colour - the rainbow in the cow block looked great! 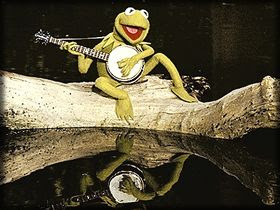 "Why are there so many songs about rainbows, and what's on the other side ...!!" Til next time - Bear Hugs! 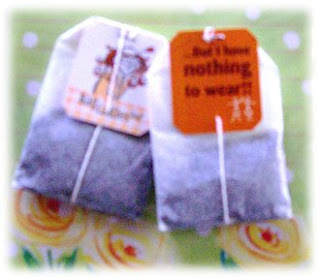 I know the photo's pretty fuzzy, but hopefully you can see the teabag labels a bit. They're "Bag Lady" tea bags and each teabag has a cute sketch of a 'bag lady' on one side and a funny saying on the other. This one has the saying of women worldwide when faced with a special social outing "But I have nothing to WEAR!" Tee! Hee! Hee! Hopefully my Swap partner will enjoy all of the goodies and there's two teabags so she can share one with a friend. 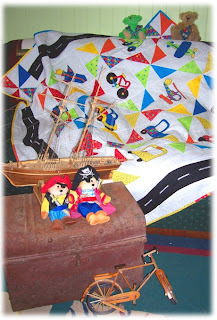 (Hope you enjoy the peek, cos it took me four or five tries to get blogger to agree to upload this particular picture!!!) 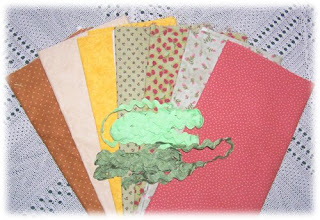 While I don't have anything specific in mind to use these for, the brown and cream spotty fabrics will be great for stitchery backgrounds and all of the others will mix and match nicely with the other shabby chic colours I seem to be using a lot at the moment. Still have a few swap items to make so no doubt they'll come in handy somewhere along the track. After all, the same rule applies to fabric as it does to bears - you can never have too much/too many!!! Tee! Hee! Hee! Isn't it wonderful and bright? Just what you need for a little boy's room, with all of the cars, trucks, planes, helicopters etc - though I think I'd be replacing the white with blue, knowing how grubby little boys can sometimes be! Tee! Hee! Hee! So that's how I spent yesterday. Today so far, I've put through several loads of washing and hung same (otherwise you just end up with lots of soggy clothes!! Tee! Hee! Hee!) 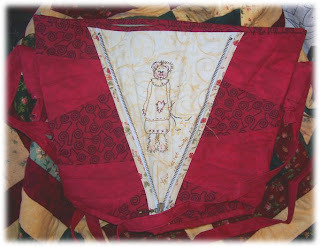 and have been working on the neat copies of the stitchery designs for scanning for the "Angels Bears" pattern. Hmmm ... has ended up being more time-consuming and tedious than anticipated and I've managed to give myself a neck-pain-induced headache (Again! Think it's time to find a chiropractor!!) so I think I'm going to take a break and go have some lunch, perhaps a cup or tea and maybe a kindy kip to get rid of the headache, before attacking the designs again. Still hoping to have the new pattern printed this week, so watch this space for a give away. Hope you're having a great weekend where ever you are and whatever you're doing. Bear Hugs! Wow! How did it get to be Friday again?!?! I'm pretty sure I missed a few days this week - which would explain the lack of posts! And the weather has been unkind to a warmth-loving summer girl, so I think I went into hibernation mode again! SIGH! Can't wait til the warm weather is here to stay! Someone said the other day it will only be a month or two before we're complaining about the heat - nuh, ah!! Not this little black duck!! The flowers mentioned in the title arrived on my desk at work yesterday. Now any of you who are married or have partners will know that even if you other half is 'perfect for you', it doesn't make them 'perfect' and there will always be little hiccups, misunderstandings and temper tantrums. Well, we had one of those in our house on Wednesday and this is where GB ended up - again!! Yep ... back in the dog house! So on Thursday, this is what landed on my desk with a card that said, "With love from the doghouse!" They are gorgeous, aren't they? 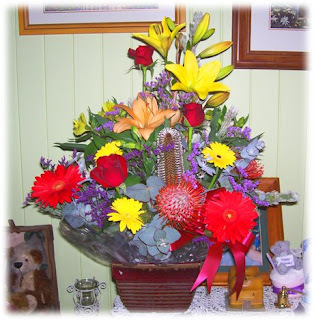 I particularly love the red roses and gerberas with the deep purples and bright yellows. SIGH! Well, I couldn't stay mad with him after that, could I? So I sent him a text message to say, "OK, the flowers get you back inside as far as the sofa!!" Tee! Hee! Hee! Can't make it too easy for him!! Nah, all is well. We sorted out the misunderstanding, which was a 'he says' 'she says' kind of deal and we're back on smooching terms. Oops! Too much information for some, perhaps!! So, that's the sort of week it's been here at the Meares' Madhouse. I'm hoping that I'll be able to motivate myself to knuckle down over the weekend and get a few things done - got the Bag Swap stuff to pack up ready to send off on Monday, need to get stuck into the three sewing bits for the Stitchers Angel and start thinking about the Secret Santa Christmas Swap - oh and try to get my Angel Bears pattern printed and packaged ready for a give-away, and stitch the latest block for Lynette's BOM .... Hmmmm ... getting the feeling that I need a weekend that consists of about 14 days!!! Ah well, will make a list and start at the top to work my way through. And whatever doesn't get done today, will just carry through to tomorrow's list!! I'll get there ... eventually!! Hope you have a fantastic and productive weekend too - Bear Hugs!